My guest today is Ganesh Swami, the co-founder of Covalent. Covalent is a tech company that provides blockchain transaction data that cuts the noise and brings transparency to the cryptocurrency market. No matter which industry you work in, you must have heard about the emerging trend of blockchain, cryptocurrency and bitcoin. To people in the tech industry, some even claim that "it feels like the early days of the internet, web 2.0. ", but to laypeople, blockchain is still a vague concept that is difficult to grasp. 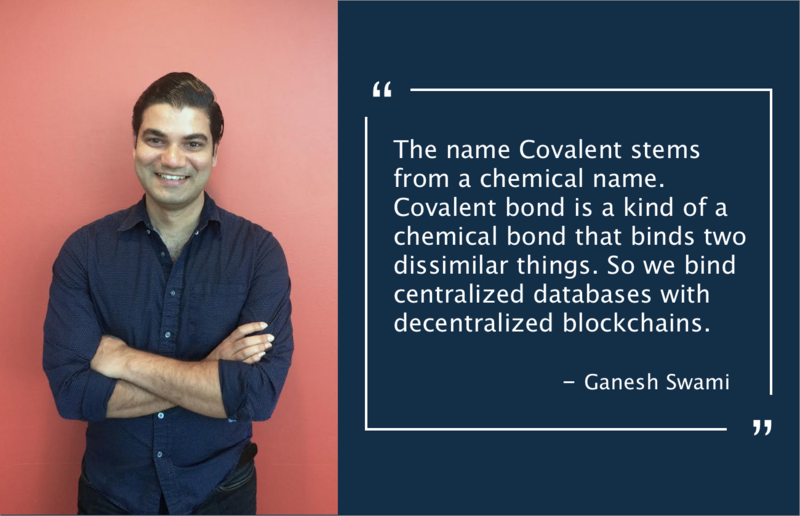 In this conversation, Ganesh shares with us his understanding of the blockchain technology, his entrepreneurial journey of starting two tech companies, and his vision behind Covalent. Entrepreneurship runs deep in Ganesh's blood. Covalent is the second company that Ganesh is working on. He emphasizes the importance of building a malt to defend your business in an increasingly commoditized market and why branding is crucial for growing a business. You will also get to an insider scoop on his upcoming adventure to reach the Mountain Everest basecamp. Kat: "You are trained as an engineer and made the transition from the biotech space to the data science world, so what was that journey like?" 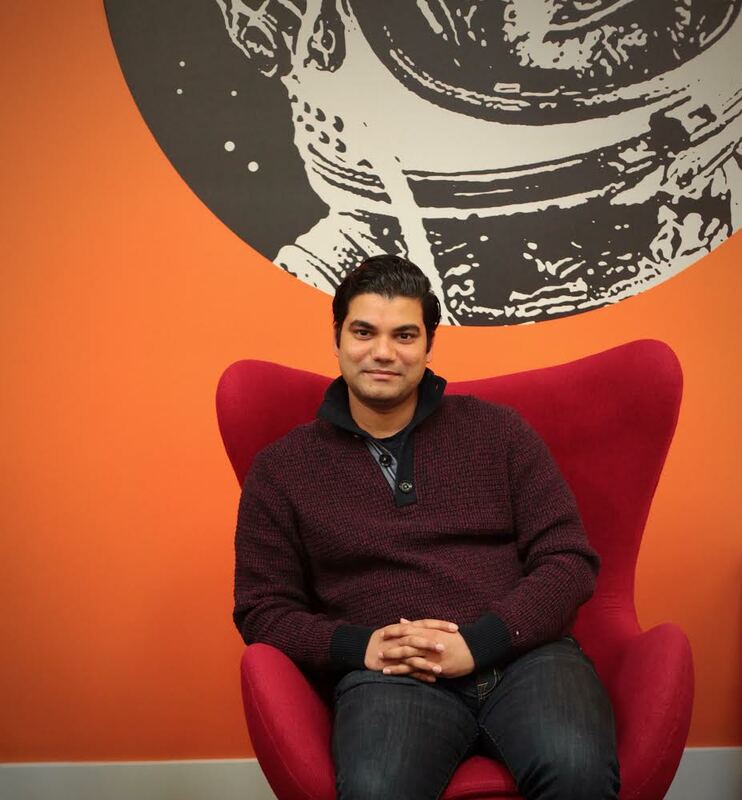 Ganesh: "I've always wanted to start a company, and somehow ended up doing engineering in school. Even in school, we have a lot of innovative projects that I and my colleagues have built. We've built the first glove that can translate sign language to voice. We were on breakfast tV, national TV and got tons of press. This was 10 years ago before machine learning and all those things are hot. We did a lot of cool projects in school. But starting a company has always been on my mind. I just happen to get this opportunity with a biotech company, and I just went with it. Long story short, About 5 or 6 years into it, it was time for me to fly the nest and do something on my own. That is when I pivoted my career to web and internet technologies. The big challenge with biotech is the time to market is 10-15 years, which is way too long. There's no fall-back plan. So if you don't raise a lot of money for the runway and do not staff up, it's a very challenging business to run. If you think about the world and the adoption of new things, they are actually speeding up. Telephone took about 50 years to reach 100 million people, Youtube took 2 years, Facebook took 16 months, Snapchat took 5 months. It just goes faster and faster. The pace of innovation is actually increasing in time, so you gotta move really really fast. The web internet space has been exciting for the last 20 years, so this is where I decide to change my career." Kat: "What's the story behind building Covalent?" Ganesh: "Covalent was an 'accident'. The story was that we had participated in a database and distributed systems hackathon, and ended up winning it. Our pitch was building a google-index style for blockchain data. The problem with blockchain is it doesn't fit in your phone, it's too big, and it's in a format that you can't really use. What we had build at the hackathon is a bridge that lets you use your existing tools like Excel and CVS on top of a blockchain so regular people can use blockchain without going through all the extra steps. It's adoption and usability tool. Covalent is in the blockchain market. First I have to make sure that the idea has legs. I picked up the phone and cold-called 50 people and had a conversation about what this was. I didn't know at that point what this thing really meant. It was a a cool project for a hackathon, but it wasn't fully fleshed out in terms of what is the go-to-market, who would buy this, who has the needs, how to make money, how to build a product, how to sequence a product and all the things that go in with building a company. I didn't even have a team for this new project. So once I spoke to about 50 people, what I realize is that 1) there isn't a lot of understanding. 2) there's no market today, maybe there's a market 2 years from now. Today, there's no immediate need. 3) people understood this in different ways. But people who've been around technology cycles multiple times understand that this is a critical need a couple of years down the line. So once I decide this idea has some legs, I can see myself working in this space for the next couple of years. The name Covalent stems from a chemical name. Covalent bond is a kind of a chemical bond that binds 2 dissimilar things. So we bind centralized databases with decentralized blockchains." Entrepreneurship runs deep in Ganesh's blood. Covalent is Ganesh's second company, but certainly not the last one he will be working on. Kat: "For our listeners who are unfamiliar with blockchain, could you share with us your understanding of what the blockchain technology is? " Ganesh: "The best way to think about blockchain is with an example. Let's say you are banking with RBC or TD. You trust those guys. When you log into your account, it tells you how much money you have in your account. They give your transactions. But how do you know TD or RBC haven't fudged the numbers? Who audits those transactions? So that's a fundamental problem. The trust issue is centralized with the banks. Likewise, with your identity. It's centralized with Equifax. Equifax had a hack with hundred millions of people's identities stolen, and there's nothing you can do. So that's a problem with centralization, trusting a centralized authority. Blockchain decentralizes the trust aspect. That' the core concept. Other than hat, it's just a regular database. There's nothing different and really innovative. But what is innovative is the privacy and trust are decentralized. You don't have to trust your Equifax or your Reddit, because censorship is pretty big on Reddit. The decentralized version of Reddit has no middle man, and no single point of failure. Cryptocurrency is essentially a token sitting on the blockchain. These blockchains enable decentralized economies. So you have people who produce and people who consume. Instead of using fiat money like US dollars , you'd use cryptocurrency to buy and sell. But the latest innovation in crypto is you are tokenizing real-world assets. You take your real estate, your car, and you piece them into a hundred million pieces and create a token out that. So people can buy a portion of your car, so any assets you can tokenize it and put it on a blockchain." Kat: "How can blockchain be applied in other industries and what are the greatest problems with blockchain adoption? " Sure. There are a couple of things that are interesting in the blockchain space. Ten years ago, if you look at the bitcoin whitepaper. In a sense it was an insurance policy against a centralized future. During the financial crisis, these banks who had these bad mortgages were getting bailed out, it was taxpayer's money. So there's a lot of these stuff going on which was not really clean and kosher. But if you think about it in a pragmatic sense. There are a couple of questions that are super interesting. What's the thesis around decentralization and blockchain. Is there a single point of failure. Could Dropbox go offline and you would lose your files. Is it a censorship issue? There's a transparency issue in which rent-seekers and middlemen take their cut in an unfair way. There are different use cases for different blockchains. It could be anonymity, single-point failure, censorship, transparency and business model challenge. There are a lot of things going on for all sorts of industries. Kat: "Can we dive deeper to discuss about what Covalent is?" Ganesh: "Covalent has a research arm. We have a team that's doing financial analysis on these different sectors. We've taken a wealth of data: 70,000 cryptocurrencies and 500 million of these contract executions. If you take a sector, for example, decentralized credit and lending, we can look at one of the platforms out there. Ethlend and Salt and look at all the contract executions that have happened against those smart contracts. We can compare ETHlend vs. Salt to see what are the default rates, size of the collaterals, maturity rates and so on. The vision behind the research team is to give data so that investors know what is undervalued and what is overvalued. With any emerging technology like blockchain, there are always aspiring entrepreneurs solving genuine problems and fraudsters which are in for the quick money. But from the onset, it's not clear which ones are scams or good, so Covalent's research and data will help you make your decisions. The second branch is a software branch. This team ingests, digests the blockchain and creates the data that's necessary for the our platform's customers or our research team. Blockchain by itself is not in a form that is not easy to understand. What we've done is putting a layer on top of it so you can understand and process the blockchain data. The research team takes the data, massage them into sectors. We have 25 sectors such as sports-betting, decentralized social media, decentralized lending and decentralized file-storage. For every sector, we look at the top players and figure out what the incumbents are up to. We always compare the centralized economy to the decentralized economy and see how robust the decentralized economy is, what the malts are. If you are an investor looking in to deploy new capital, you have access to all these sectors and see which sectors are solid." â€�By analyzing troves of blockchain data, Covalent's Research branch is dedicated to produce in-depth reports on 25 crypto-sectors. Kat: "What are the greatest challenges you have been facing so far along this startup journey and how did you overcome them? " I think of the challenges as risk factors. You are constantly trying to de-risk the business, that's how I've come to think of it. Initially, I used to think about these problems differently and I think those were not the right ways to think about them. Now I think about risk-bundling. There is team risk. If your co-founder, designer or salesperson are not good fits, then that's a team risk. Your whole company could collapse because of co-founder fights. There is capital risk. If you don't have the capital to see your problem to be solved or the resources to take it to the market. That's a big risk. So you might be able to build a software platform but not go to market because you haven't allocated money for sale and marketing. There is market risk. Are you building stuff that the market truly needs? A lot of the crypto projects out there are solutions looking for a problem. To be honest, Covalent is a solution looking for a problem. You have to match the market and the resources you have, the stage you are at, with making money. You need a business model from the get-go. Another risk is your malt. If you are not building a malt around your business, then anyone can just come and clone your business. They can undercut you on price and that's a big risk. You have to think about how you are going to acquire customers, how to be profitable, how to be defensible 1 or 2 years from now. ðŸ”­ For anybody who's thinking about starting or bootstrapping their own business, what's the top advice you have for them? I only have experience with software as a service business. I'm not sure about other businesses. But in the SaaS business, recurring revenue is your magic. You are trying to get to that recurring revenue model and engine, but it's going to take awhile to get there. So what do you do in the meanwhile? You have to make sure you have the funding and cash flow to fund your growth, which means you can't pay up crazy customer acquisition costs with payback period of 2 years because you'll go out of business. You'll need something that's 3 to 6 months. You have to manage your cash flows. All the blog posts and books that you're reading out there are for VC funded businesses which means they have cash to blow but they can also go bankrupt. Failure rates are pretty high. Everyone should bootstrap their business to get if off the ground. You have to approach things a little bit differently. ðŸ¥�What has been the most important skill in building your business? I'll answer this with a non-answer. I think being stubborn and flexible at the same time is very important. It's crucial to succeed as an entrepreneur. You need to have a problem you need to solve. You need to run 100% toward that problem space and try to figure out what's the solution. But you also have to be flexible in the details of how you are getting there. For example, just because you are a programmer, it doesn't mean you necessarily have to write the most beautiful code. What you're trying to do is figure out if the market needs the solution. So you might need to be flexible in those details. ðŸ“šCould you share with us your role models or any useful resources from which you draw inspirations and helpful insights? Behind the Cloud by Mark Benioff, CEO of Salesforce. He has 5 or 6 chapters in that book about what is a product, how to go to market, how do you build your brand and malt. I've read that book 10+ times. Self-education: Mr. Money Mustache's blog and Reddit's Personal Finance. It's important to understand the value of debt and leverage. I think it's intentional that people in high school don't know how basic finance works, how debt works, what interest rates mean. That's why people graduate from college are saddled with college debts. That puts you far behind compared to someone who understands debt. ðŸ—»What's your adventure for this year? This year, I'm happy to say that my partner and I are going to the Mountain Everest Basecamp. So that is going to be in September. It's a 2-weeks hike from Kathmandu to the basecamp. If the weather permits, we'll be climbing up to Kala Patthar to see the summit. We're training pretty intensely because it's at 5000m and there's nothing like that here in Vancouver. You can find more about Covalent on their website and sign up to know when Covalent is launching their software platform. You can also follow Covalent on Twitter and LinkedIn, and check out Ganesh's personal blog. If you're in Vancouver, feel free to drop by and say hi to Ganesh and his team at Launch Academy in downtown Vancouver. They will be happy to talk about blockchain and cryptocurrency over a coffee chat.